Its been at least a few months since I did much Aircraft spotting… My good friend Sung came by and I persuaded my lovely wife for the Short trip plus ( a great lunch in Babe’s Fried Chicken) to KAFW Alliance. 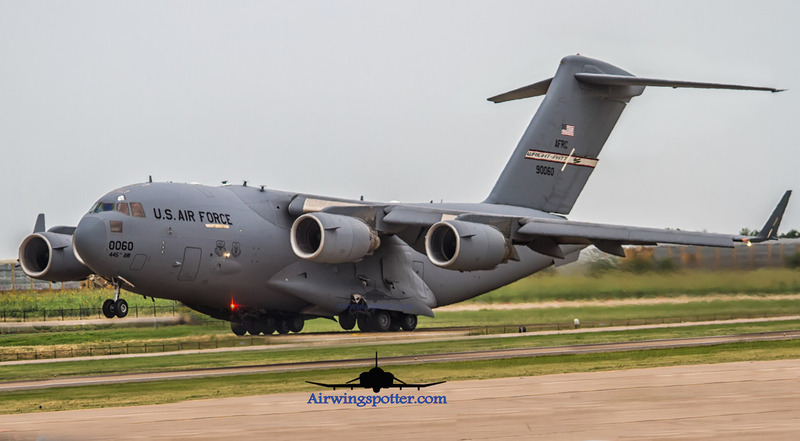 Got there about noon and was greeted with a C17 on the ramp doing her Engine up. While this was going on radio chatter showed a Navy T44A came in for an option run on Runway 17L . She came and did a good touch and go . The C17 followed and did a graceful Giant take off right after. I manage to position myself and try for a take off shots but including all the static aircraft on the tarmac. The result was astonishing shots with what I tried. Fainally, the T44A came back and landed. I was hearing some radio chatter in KNFW and we decided to move on Hoping to catch some Lockheed traffic …. Unfortunately, the drive was not as easy since there is a big traffic pile up on I35W. I tried going by the smaller roads and still get into a horrific traffic jam. We decided to call it quit after several attempts and we head back to Roanoke for our lunch in Babe’s Fried Chicken. that turn out to be a great choice.